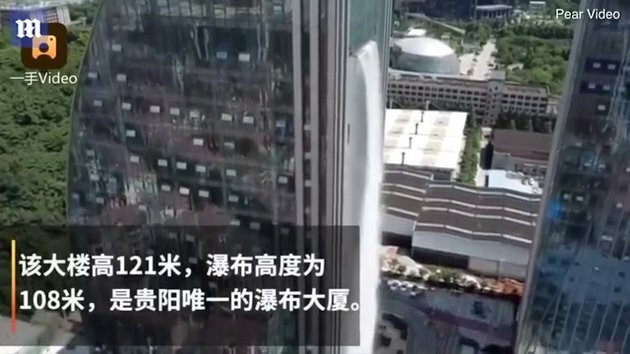 Residents in Guiyang city, south-west China thought they were imagining things when they saw a massive waterfall cascading out of a high-rise building in the middle of the street. Like a mirage out of nowhere, the towering artificial waterfall stands 108 metres (350 feet) tall on the outside of Liebian Building located at a public plaza in the city's central business district. A large tank is installed at the foot of the 121-meter (397-foot) high skyscraper, where four 185-kilowatt pumps lift the water to the top of the fall. Nearby houses must love that water mist floating around. Hot, 99% humidity & water mist... great. .......UPDATE apparently it only costs £89 an hour to run and it's only switch on on special occasions. 'Our building has a four-storey underground water storage and drainage system, from which the water is pumped and recycled,' Mr Cheng said. The electricity bill for just one hour of operation is a whopping 800 yuan (£89), he added. 'That's why we don't switch on the waterfall every day - only for special festivities in the city,' he said. And each time, the waterfall is set to run for only about 10 to 20 minutes to save electricity. But ingenious and very aesthetic!